I Am a Professional Artist offers Artists who've chosen the professional path, practical steps in harnessing one s creative abilities to succeed and survive in the Arts and enjoy your artistry at the same time. Including interviews with various professional Artists. The book combines a self-empowering practical guide in surviving and succeeding in the Arts with key business principles and spiritual nourishment. Consider it an Artistic soul s survival guide in business! I AM a Professional Artist follows 2 simple principles: If you want to be a professional Artist, the first thing to realize is that you have to be two people: An Artist, and a Business person. The second principle is based on her own coined phrase: The three Os: Optimism + Organized equals Opportunity. I Am a Professional Artist will certainly change the thinking of any professional artist who may doubt themselves or may feel the hardship of the roller coaster ride. Gilli Moon is an artist entrepreneur. A creative warrior. She is an artist, author, coach, motivational speaker and CEO of Warrior Girl Music. She is a world renowned Artist and the voice for creative entrepreneurial success, having created a global community of devoted followers, empowering artist entrepreneurs, songwriters and “creative warriors”, inspired by her unprecedented DIY artist success and her unparalleled expertise. She has provided platforms for over 50,000 artists and creators to become engaged, enlightened and empowered plus she has over 100,000 followers and fans of her own creations, music recordings and live performances as an artist. She is a self-made brand. Her mission is to help you get engaged, feel enlightened, and become empowered. Her goal is to work with you to build your personal or professional dream, to achieve your goals, develop your skills, and empower you towards a life or career you've ALWAYS imagined. "I commend you for your intention to produce a work that empowers the individual. It's not just anyone who will take the time, invest the creative energy, and actually follow through on the plan for such an endeavor. I hope you take pride in what you have already accomplished...live with passion!" 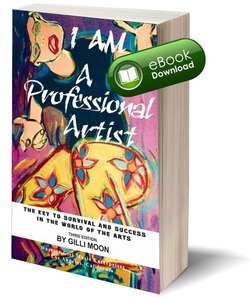 “No matter what the 'Art', all Artists can identify with and learn from this book. Simply stated, "I AM a Professional Artist" provides the reader with logical and realistic 'truths' to being an Artist; something most Art schools fail to do. Gilli has succeeded in putting to paper, lessons and advice that we, as film distributors, have spent years giving to independent film makers”. "One of the best ways creative people can discover a blue- print for prosperity is to absorb and emulate the strategies of successful artists. Gilli Moon is one of those artists. In her book, she bares her soul and shares the attitudes and actions it takes to make a true impact as a professional artist. Highly recommended!" ... "Gilli's book helped me define my goals and what success and dreams and visions mean to me as well as art and business. I love and enjoy making mine and others dreams come true! An encourager of faith and dreams is what I will continue to strive for! "Dream the IMPOSSIBLE!" ..."I found it to be a work of inspiring, practical, fair dinkum advice. The chapter dealing with "Get a Job" prompted an intense discussion between my husband and I resulting in him going for a job he wouldn’t have normally considered... I expect, just writing your book, has been hugely cathartic and enlightening for you. I found it fab!" ..."This couldn't have come at a better time in my creative growth. I'm experiencing some serious writer's block and really appreciate the love and support you express in this message. Your generosity of spirit is truly appreciated." THE CREATIVE WARRIOR ACADEMY™, a subsidiary of Warrior Girl Music, is the world's most comprehensive empowerment and coaching program for artists and creative seekers. The Creative Warrior Academy™ is an online series of programs, courses and events, a collection of educational products, books, videos and resources, as well as group and in person training/coaching. Since our programs only open a few times per year, please ensure you receive notifications about our offerings by entering your name and email at www.thecreativewarrioracademy.com. The Creative Warrior Academy™ founder is GILLI MOON - a world renowned Artist and the voice for creative entrepreneurial success. 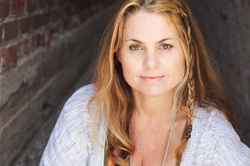 Having created a global community of devoted followers, empowering artist entrepreneurs, songwriters and “creative warriors”, inspired by her unprecedented DIY artist success and her unparalleled expertise, Gilli Moon is an Artist, author, coach & creative business strategist, motivational speaker and CEO of Warrior Girl Music and Warrior Girl Creative. GILLI MOON's mission is to help artists and creative seekers get engaged, feel enlightened, and become empowered towards a life they've always imagined. Gilli has provided platforms for over 50,000 artists and creators to become engaged, enlightened and empowered plus she has over 100,000 followers and fans of her own creations, music recordings and live performances as an artist. She is a self-made brand. We don't believe in "get rich" programs - actually more like slow and steady philosophies, lifetime enjoying the journey, and working hard. Our intentions are to help artists and creative seekers become self-empowered to discover the tools, resources and opportunities that will help them achieve their dreams. Our programs take a lot of work and discipline to create. Don't get involved in our programs or coaching if you are expecting some kind of silver spoon delivered to you on a platter, or if you think that you don't have to work hard at it. We prefer working with individuals who are ready to work hard, become self-empowered and have a "go get 'em' mentality. As stipulated by law, we can not and do not make any guarantees about your ability to get results or earn any money with our training, products, courses and strategies. Every person will respond differently to what they receive and what you are able to accomplish is totally up to you based on who you are. We can only offer the content and direction to get out there and hope it helps you. Nothing on this page or any of our websites is a promise or guarantee of results or future earnings, and we do not offer any legal, medical, tax or other professional advice. Any financial numbers referenced here, or on any of our sites, are simply estimates or projections, and should not be considered exact, actual or as a promise of potential earnings - all numbers are illustrative only. Read our terms, privacy policies and disclaimers here. Meanwhile, get engaged, feel enlightened and become empowered today! © 2016-2018 GILLI MOON. All rights reserved. No unauthorized duplication or sharing of content without permission.